YourTea has always been my go-to when it comes to doing a teatox. I've religiously used their Tiny Tea and Anti-C tea for over a year - and it's fabulous. When an opportunity to try another teatox came my way, I jumped at it. With law school ruling my life I've had to resort to things like this to keep myself fit without the workout. Although I've experienced great results with Your Tea, they were relatively minor. I certainly noticed them but not everyone around me did. With Skinny Teatox, however, I saw major results....Well, let me clarify, as major as you can get with a tea. My inner thighs slimmed out, which is my main trouble area, so that was extra exciting. My belly bloat pretty much disappeared within a week, and I just felt thinner overall. Needless to say, I will be using the Skinny Teatox going forward. My plan is to use it in combination with my Anti-C tea from YourTea, because that has really reduced my cellulite since I started it in February. The loose tea is meant for the morning since it is naturally caffeinated. You measure out a teaspoon of leaves into the adorable infuser or one of your own choosing and steep. I usually add half a pack of truvia and a splash of lemon juice. While the loose leaf tea doesn't bother me since I'm an avid tea drinker, those of you who aren't as into tea may find this to be annoying. My one suggestion to Skinny Teatox would be to put this morning blend in teabag form. The teabags that did come with the kit were meant for nighttime, every other night during the 14-day cleanse. I recommend drinking this tea early in the evening because they do have a natural laxative in them. 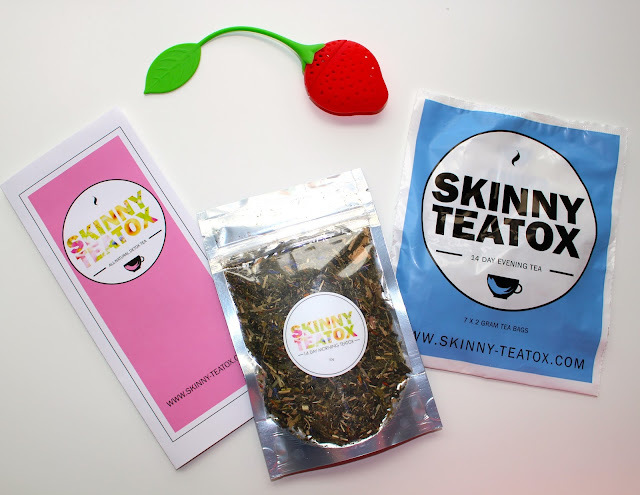 Skinny Tea provides in-depth details about this and everything they indicated occurred with me. I definitely believe this aided in the detox process and provided me with more significant results, so don't be alarmed by it. I also want to highlight that I did not experience any negative side effects when using it. Even though my 14 days are over, I still have some of the morning loose leaf tea left and will be ordering more very soon. I high recommend this for both teatox newbies and veterans alike. Let me know if you plan to give this a whirl in the comments below! Thanks for reading Right to Remain Fabulous' latest post! Please share and subscribe so we can continue to built a fabulous community.